Public Auction with RESERVE - Ruth A. Wenzel Trustee Properties LAND AUCTION - Saturday, March 2nd, 4 PM at The Cedarstone, 610 S Division Ave, Polo IL Registration at 3:00, Auction at 4:00 PM sharp. WENZEL FARM Very Nice Class A farm located approximately 3.5 miles South of Polo, Il. on Rt. 26 and W. Edgewood Road. Approximately 69.05 acres predominantly all tillable with excellent soils and is available to farm for 2019! They do not get any nicer than piece of farm land! Great soils! Great location! Easy to Farm! 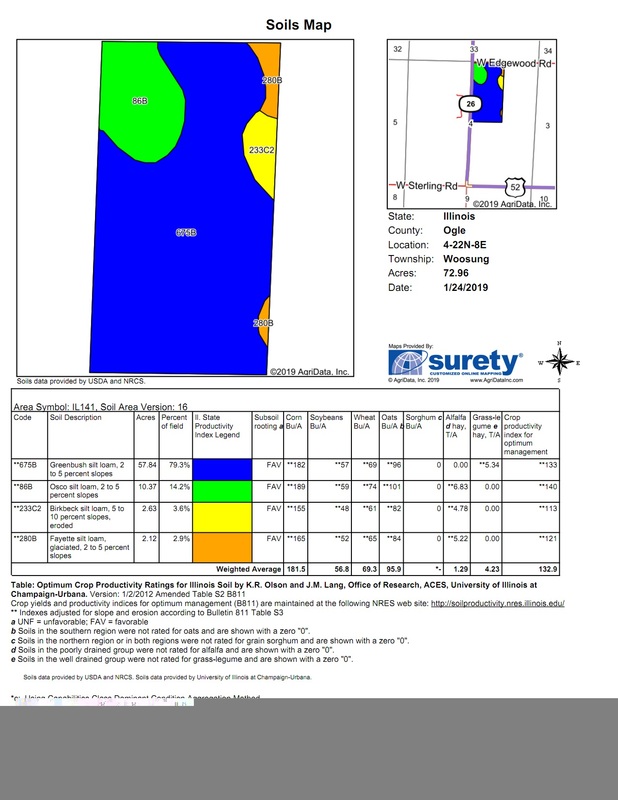 TOTAL ACRES: 69.05 Approximate TILLABLE ACRES: 66.00 Approximate SOIL PI: 132.9 Greenbush Silt Loam, Osco Silt Loam, Birkbeck and Fayette Silt Loam TAXES: Information coming soon Final price is subject to final survey after auction.